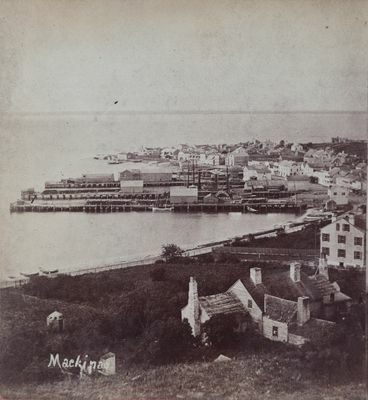 Stereoview of the harbour on Mackinac Island taken from the front of Fort Mackinac. In the harbour is the side wheel steamboat MAGNET and an propeller. Along the wharf and on the beach are a number of Mackinac boats. On the wharves is stacked cordwood as fuel for the stopping steamboats.